From an article in the NYT. This quotation would have made much more sense had I read enough of the beginning of the article to know that Ariel was the name of a West Bank Settlement instead of referring to Ariel Sharon. I was puzzled at why the Times would refer to the Prime Minister of another country by his first name. Initially, Israel would place a high-tech barrier around Ariel, but the barrier would not run from the settlement to the West Bank frontier, Israeli officials said. After Ariel is encircled with the new barrier, a process expected to take months, the government will again consult with the United States and decide whether to extend the barrier from Ariel toward the West Bank frontier, where it would meet the existing barrier. The meteoric rise and fall of Belushi was the stuff of which legends are made, overshadowing his brilliant comic gifts in favor of the sordid details. Why do people say "meteoric rise"? Has anyone, anywhere ever seen a meteor rise? The conference I attended was on social psychology and aging, and it included a brief mention of a recent finding regarding advance directives. The finding, like so many in social psychology, is not very surprising once one thinks about it and so gains its potential profundity from one's probably not having thought about it: evidence indicates that people giving directives in advance of an illness say they want less-heroic-measures than people actually in the midst of the illness. I was reading a trashy mystery lately where the thirty-ish spunky detective said that once she needed a diaper in order to go to the supermarket, that was it, she wanted someone to kill her. One can imagine the detective being so adamant as to be willing to sign an advance directive to this effect. At the same time, the vast majority of older people who find themselves needing a diaper to go to the supermarket still would just as soon go on living. So the detective could find herself in that situation where she has signed a sheet of paper saying that she wants to die if she's ever in that situation. Fortunately, under current laws, you cannot kill someone if they say they want to live, even if you have written permission to the contrary. Move to real cases, of course, advance directives are intended to kick in precisely when one is incapacitated and cannot express what they want. The problem is that advance directives, in terms of expressing actual wants, may actually only represent the lower bound in terms of the amount of heroic-energies that persons who are incapacitated would like expended on their behalf if their ability to express a non-advance-directive was not precluded by their being incapacitated. Which is, one might imagine, the opposite of the type of error we might want to make--that is, where we might think the best direction effort is to provide more-heroic-effort than the person wanted, advance directives might actually lead the medical system to under-expend. A virtue of advance directives is that it spares the immediate relatives of the incapacitiated person all the troubles involved in speculating about what the incapacitated person would have wanted. I have been in that situation (the immediate-relative situation, not the incapacitated-person situation), and so I have some sense of the unpleasantness and uncertainty that surrounds decisions about life support when an advance directive is in place. In the absence of the present-self being able to express their wishes to us, it's seems obvious that we might pine for some guidance from a past-self. It's strange to think then there might be reason to wonder if this method for having the past-self speak in situations where the present-self cannot might actually provide a voice that is more naive than what it has been credited as being. I'm writing this post from the Bertucci's near the campus of George Washington University, in Washington DC. I won't get to post it until after I get home tonight. The conference that brought me to DC is finished, and I'm about an hour from having to leave DC for my flight. Truthfully, I skipped out of the conference a little earlier, and walked down from the National Academy of Sciences building to see various memorials--the Albert Einstein Memorial, the Vietnam Veterans Memorial, the Washington Monument. From there, I went to the cel phone and called Kathryn (a GW alum) and went on a talking-while-walking tour commemorating some of her favorite campus sites, including the various dorms she lived and worked in while she was here (William Fulbright Hall, John Adams Hall, Thurston Howell Hall, Anthony Michael Hall, and Jacqueline Bouvier Kennedy Onassis Presley Hall). Now I'm having lunch where she had her first date with her college boyfriend Stefan, who when they dated was a 15-year old sports agent wunderkind and who has since vanished off the face of the earth, perhaps as a result of his brief representation of Todd "Willis" Bridges for his appearance on Celebrity Boxing. So now today not only do I find out that Robert Palmer and George Plimpton have died, but they have announced a recall of the Segway Human Transporter as well. This on top (not literally) of Gordon Jump, John Ritter, Johnny Cash, Alan Thicke, and Warren Zevon all dying. These are truly dire times. Update: An excitable reader from Cedar Rapids, IA notes that Alan Thicke wrote the theme for Diff'rent Strokes, which, along with Gordon Jump's association, raises the possibility of a serial killer on the loose killing those with peripheral associations to that show. Somebody check on Mr. T! "Did you see where the All Girl Summer Fun Band is playing the Catacombs this Friday at 8pm? Is that actually true or some weird crusader ploy to attract the unwashed for some mass conversion attempt." "I hadn't heard. Lots of indie bands play there, so i wouldn't be surprised." "You mean indie in the conventional sense of 'independent', or indie in the sense of 'in deep with The Lord.'" "In deep with the Lord, of course. I'd stay away from there unless you want to end up with a role in a Christmas pageant." "Oh, I know. Last year I went to a Sixpence None The Richer concert there when suddenly I turned and a man in a trenchgun was pointing one of those tranquilizer-blowguns at me. Next thing I knew I had been abucted and forced to play the role of Bartholomew in Mel Gibson's Passion." Thanks Rob for the guest eulogy for Gordon Jump. Thanks to all who have sent inquiries into how I have been coping with life post-GJ. I'm doing fine, imagining GJ looking down on me from the great Maytag repair shop in the sky. You can bet there are as few emergency calls for Maytag repairmen in heaven as there is on earth. Sometimes it seems like everyone dies. Unaware that he's being lured into the carefully crafted trap of a child molester, Arnold eagerly agrees to perform a simple task in return for an overly generous reward from a "friendly" neighborhood merchant. Arnold and Dudley's "friendship" with a local merchant reaches a dangerous turning point when, unbeknownst to the boys, the man, who is actually a child molester, is about to make his move. Hanson goes undercover as a punk rocker in an effort to stop a feud between two rival gangs from turning into a war. In the process, he discovers that his father is not actually the friendly bicycle man that he has always presented himself to be but actually a powerful gang leader and radio station operator. I'm living on the air in Cincinnati, Cincinnati, WKRP. I'm at WKRP in Cincinnati. i thought the theme song to wkrp seemed like a perfect way to eulogize our dearly departed friend, gordon jump (a.k.a. "maytag man"). we do wonder what has become of gordon jump, as he is surely living on the air somewhere, be it cincinnati, or somewhere outside of ohio's confines. and, yes, while we were never meant to be, i will most definitely think of him once in a while. what do freese men love? football. the hawkeyes. and hats. 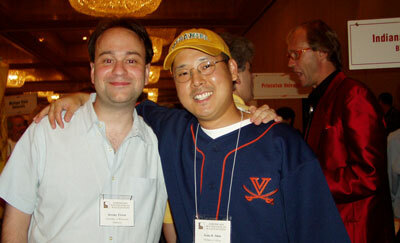 (Your weblog author, right, with his father, who is wearing his homemade Hawkeye cowboy hat. 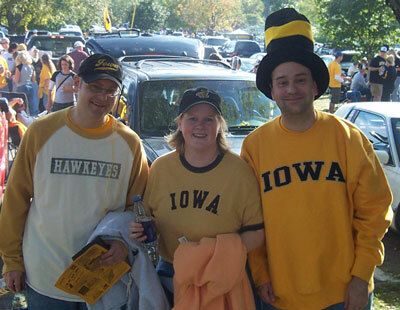 Update: A reader from Westminster, MD writes to note: "After seeing your latest photo on the weblog, you have totally got to get one of the Hawkeye beak hats that some guy is wearing in the background." I agree! 1. I realized recently that, due to some rather complicated turns of events that I would rather not go into on the weblog, I am statistically more likely to be a homicide victim now than at any previous point in my life. Whereas before I think my being killed would pose a mystery for police because there would have been no obvious suspects, now it might be equally mysterious because they are several. It's an intriguing feeling, really. You'll forgive me if I no longer broadcast what dark lot I have pushed the RV into now. 2. I realize that everyone complains about how gossipy their workplace is. Lately, however, I have been confronted with several unrelated instances of me or other people not knowing things around here that, really, it's remarkable that we had not heard before through some grapevine or other (nothing about me, so don't try to be Encyclopedia Brown). In other words, I'm starting to think that the UW Sociology Department is not gossipy enough, or maybe just that the lack of information propagation may speak to there being something wanting about the social dimensions of the environment here. 3. I broke a full length mirror in the RV yesterday. Just what I need: a seven-year run of bad luck that will take me up until when I am pushing forty. If there had been any cats or dogs present, I don't know if there seven years is served in solar-years or cat/dog-years; I would hope for their sake the latter. Incidentally, regarding the RV, someone said recently that I seemed like the sort of person who would live in an RV. I have no idea what that is supposed to mean. 4. Gordon Jump is dead. Update re: #1: A reader from Kearney, NE, e-mails: Jeremy--I just read your weblog entry. I have a great fear of being murdered, and would never use my real name and place of work on the internet because of it. I have a friend who has a website and posted his full name, address and phone number as part of his resume. I asked him, aren't you afraid of being murdered? You and your entire family? Anyone can find you. He said no, he wasn't worried. I didn't understand, but he was still alive as of last week, unless his murderer is sending out e-mails in his name to cover up his hideous crime. In any case, I would have noticed a triple homicide in [location], and their last name is very memorable as it has a number of less-common consonants. At least, less common to me. after the third week, babycakes and the rascally rita-and-ashley twins have opened up a lead on everyone else, but i have caught up to shelley correll and now am tied for fourth. i'm assuming for now that rob is just playing hard to get, at least if he knows what's good for him. I am at the Washington Reagan airport. It's about 1:50pm; my flight has been delayed until a scheduled time of 2:34. It's raining outside, although I can't really tell how hard it's raining because there is nothing outside the airport windows to lend a good sense of perspective. I'm bored and have just opened up my laptop with the idea that maybe I could write a weblog post as long as I'm here. My flight is the second to last flight that United is still saying that they are going to fly out today. Everything afterward is cancelled. There is a large group of people standing over at the ticket counter trying to plead their way onto the flight or get hotel reservations or make pointless complaints or whatever it is people do when they are suddenly looking at being stranded some place they don't want to be for two extra days (most people here do not seem confident that they will be flying much out tomorrow). The woman behind the ticket counter becoming increasingly annoyed in her announcements. "We do have applications here if anyone wants one," she said a few minutes ago, presumably referring to the idea that You Could Come Work For United Yourself If You Think We Are Doing Such A Bad Job. What she wanted earlier was for everyone to be standing in some kind of line instead of standing in a giant creeping clump around the counter. What she wants now is for some of the people that formed a line to go upstairs and use the ticket agents standing their for their rebooking, etc., than continue standing in line. She has this great melodramatic voice. "If you're patient, it's fine if you want to wait here, but [the agents upstairs] keep calling and asking where everybody is, they've got plenty of people to help you upstairs." She's said something like this a couple of times already. There was a small migration the first time, but I think now she is just giving people the sense that they are suckers somehow if they give up their place in the line at the gate. Oh, and when she first got mad, she did this short riff on how they were getting reports of swells of five to seven feet and that if the "Potomac out there" had a swell and went over the tarmac, no one was going anywhere. The Potomac is indeed out there, but it's always there and I have no point of reference to know if it is looking particularly feisty today. There is also a guy at the counter who occasionally makes announcements, but he mutters and is completely unintelligible. I haven't seen anyone react to anything he's said, so I'm presuming that either his announcements are innocuous or extremely important but just as unintelligible to everyone else. I'm confirmed on the flight and so as long as it leaves I'm presuming I'm going to be on it, unless I get bumped by somebody offering some kind of enormous bribe. I'm reading the fourth Stephanie Plum mystery, Four to Score, which I picked up in the airport bookstore earlier. Perhaps more on this later. I'm not sure if I should be annoyed with the conference organizers or not for not seeing that there was a high enough probability that the hurricane was going to interfere with the conference to cancel it earlier than the night before. I probably shouldn't be annoyed, and this is probably just my propensity to complain typing. Give me a keyboard and I become such a whiner! Okay, that's not entirely true, as I have shown a remarkable capacity to whine across a variety of output devices, most notably my mouth. have a cold? the flu? what about cancer? This will cure any common cold/flu. Extremely helps maligant diseases cancer, hiv, sars, etc..
A disease must be made DORMANT to stop infection and this new product will make it do so! WE ARE THE ONLY COMPANY WITH RIGHTS TO SELL THIS PRODUCT. ALL major drug companies are trying to get the rights to sell this. WE ARE THE FIRST to extract this wonderfull new product, and only us. >you already had the cookies, you FINALLY found the milk,...GOT JESUS??? > you already had the cookies, you FINALLY found the milk,...GOT JESUS??? But anyway, he was talking in his cel phone about whatever business he was involved in, when I heard him say "Well, you know what my mama always used to say about the old maid". I heard it, at least, as being said with a lecherous cast, like it was being offered as the set-up line for a lewd joke. There was a pause of more than a beat, as though the person said something beyond the prescribed straight line of "What?" Then the man said, I think, "She said she always likes the room". My taxi pulled up shortly thereafter. Granted, it was not a long taxi ride to my hotel. But I spent the whole rest of my time in line and the taxi ride trying to figure out what this punch line possibly meant. Like I said, it sounded like it was supposed to be some kind of bawdy joke, but I don't get it. I even tried substituting in various words that I could have misheard and trying to make a joke out of those. But I'm pretty sure what I heard and typed above is quite close to what was said, if not exactly right. Perhaps the joke is the lewdest thing that has ever been typed by human hands, and I will be kicked off blogspot, fired from my job, and imprisoned on an island for the the inadvertently salacious just for posting it. Special weblog contest #7: Explain this businessman's joke for me, whether it be the joke above or some near miss that would make sense. And do so quickly, because this is supposed to be a weblog for the whole family, and so if this is something unspeakably lascivious I should know so I can erase it immediately. My mother is closing the forwarding gap with the rest of the e-mailing world. The kidneys story, for example, I first received over e-mail probably 3 years before I got it from my mom. However, on 9/18 I received a forwarded message from Jan, and then on 9/21 I get the same message from my Mom. And yet, it's not quite the same message, which leads us to embark on an exercise in comparative e-mail analysis. It's intriguing to think that in addition to all the people out there who forward messages along, there are some who decide the message also needs to be tweaked here and there along the way. And then you can wonder about the internal dialogue that led them to make this change or that, akin to what literary scholars do when they go through the galley revisions of Ulysses. Of the two messages, I believe that the one Jan sent me was either first or that it's closer to the Ur-message that inspired both than my Mom's message. I believe this both because I received Jan's message first and because of some of the characteristics of the differences between the two messages. deos not raed ervey lteter by istlef, but the wrod as a wlohe. THIS IS REALLY AMAZING - TRY IT &SEE WHAT YOU THINK! 1. THIS IS REALLY AMAZING - TRY IT &SEE WHAT YOU THINK! "The paragraph needs a little attention-getting teaser at the front, so people won't just think it's a drab little paragraph typed out of some newspaper and not bother to read it. Plus, it will clue people in that there is something remarkable about the paragraph that follows, in case their minds so subconsciously parse the scrambled letters that they don't even realize that the letters are scrambled. And if you want to get the attention of busy e-mail readers and put them on their toes, YOU NEED TO USE CAPITAL LETTERS." 2. at an Elingsh uinervtisy "Cambridge University won't mean anything to most people out there. Let's change it to 'English', because, unlike the ungrateful French, England stood beside us in the war. Besides, 'Cambridge' is also the name of a brand of cigarettes, and I would hate for any little kids who might get forwarded this message to start smoking on account of it." 3. is "'letters be at the right place.' That isn't really correct. Isn't it sad how no one knows English grammar anymore? You wouldn't get mistakes like this all the time in e-mail if Ronald Reagan had invented the Internet instead of Al Gore. Let's change it to 'is'." 4. toatl "Oops. There's a word that's more than three letters that's not scrambled up at all. Well, that's easy enough to fix." 5. the huamn mnid "Hmm, this makes me suspicious of the politics of the person who wrote the message. Human minds don't read, humans do. So let's change that to 'we', even though it will mean cutting out two scrambled words. A shorter message is more likely to be read and forwarded, anyway." 6. it slef "Suspicions confirmed. Only crazy liberals spell 'itself' as one word, since right there in the King James Bible it's two words. If 'it self' is good enough for the Apostle Paul, it's good enough for the people reading this message. Plus the pinko author has put a comma where one isn't needed, so I should remove that, too." Sorry for the dearth of weblog posts. I wrote at least one other post from my time in DC that did not properly upload the first time I tried and so which is not available yet. Now, in less than a half hour I will be on my way to Iowa City to see the Hawkeyes at Arizona State. So, unless I get a chance to blog from Iowa City (unlikely, since I'm not bringing my laptop and figure Iowa will avail itself of future opportunities for my blog-from-every-state quest), you will not hear from me again until Sunday. I am currently sitting in my hotel room in Crystal City, VA (right near the Washington Reagan airport). I am here for a talk on survey attrition that I was supposed to give tomorrow; this is the talk for which I spent all day Monday prepared several million handsome Stata and Excel graphs. The conference, however, has now been cancelled, as the entire Washington, DC area appears to be closing down and boarding up in preparations for this hurricane. Moreover, my flight tomorrow night has been cancelled as well. I learned that it had been cancelled when I called to try to get on an early flight anyway since I have nothing to do tomorrow (all the DC museums, etc, apparently will also be closed, and word is that the Metro is going to shut down at 11am). I was told that absolutely every seat on every morning flight out of here is booked, but I was able to get on a 2pm flight, which should precede the arrival of the Isabel-apocalypse. My worry is that my flight will end up being delayed and then cancelled and then I'll end up getting stuck here until Saturday. I am supposed to be going to Iowa City this weekend to see my beloved Hawkeyes play, and if I end up missing that I will be inconsolable. Anyway, enough whining. I do have a high-speed Internet connection and have posted a blog entry now from my third state (Wisconsin, Georgia, and now Virginia). Maybe I will make it a goal to blog from every state. Which would be a pretty lofty goal for me, considering I think there are at least twenty states that I haven't yet set foot in anytime in my first thirty-two years. A interesting graph to make would be one tracking the length of Gregg Easterbook's weekly NFL columns (now at ESPN.com) over the last 3-4 years he has been doing them. He's one of those writers who has crossed the threshold from being kinda-funny to being kinda-funny-and-kinda-annoying, especially now that his columns involve more extensive digressions into politics and evaluations-of-various-women's-attractiveness. Meanwhile, the sheer length of his weekly columns has gone from being kinda-quirky-and-endearing to being kinda-tiring-and-scary. I wonder if he needs some kind of intervention, or if he keeps being propelled to write more and more because of the many e-mails he quotes from readers, sort of like the posting-addiction-theory that was proposed on this weblog awhile back. Anyway, if there were a large coterie of people simultaneously interested in professional football and speculations about mental health, I would start a pool to predict when this guy is going to have some kind of implosion/breakdown/meltdown/epiphany-that-requires-a-leave-of-absence. Shelly B, through her media connections, knew someone who was going to be doing a magazine interview with Paul Westerberg and was looking for questions. She asked Brady Potts, a graduate student who has parts of Replacements' album covers tattooed on my body, and me, who credits Westerberg with helping preserve my sanity in my undergraduate and early graduate school years. Alas, we have no indications that our questions were actually asked, so I thought I would record them for posterity here. 1. RIAA Suing Downloaders...whaddaya think 'bout that? 2. Is Grandpaboy a violent man, or is he just misunderstood? 4. Why'd you throw the corn at us in Madison? 5. Do obsessive Replacements fans scare or bother you? 6. Why'd they push the release date for "Folker" back? 7. How'd Grandpaboy get over to Fat Possum records? 8. Do you need a bass player? 1. Does he still feel a warm glow from the high school being named Westerberg High in Heathers? 4. Does he feel like he has become a better lyricist over the years, or does he think "Dope Smokin Moron" was as good as it got? 5. Presumably The Replacements' two great songs about unrequited love and public transportation, "Kiss Me on the Bus" and "Skyway", were not about the same woman. Did the women overlap? Did the bus-woman know about the skyway-woman? Was she jealous or just resigned about it? 6. Who would he say is the most important musician to come out of Minnesota: him, Bob Dylan, Prince, or the bass/dobro player from the Gear Daddies? 7. Does he needs a sociologist for his band? 8. What about a weblogger with mad Stata skillz? i'm sitting snug right where i want to be in rob's nfl pool. i'm tucked in just behind the leaders and ready to fly past them like seabiscuit down the homestretch. at the moment, i am also sitting right where i want to be in rob and amy's backyard pool, but that's a story for another day. It's still regularly misspelled that way, which is one of the reasons I encourage an alternative pronunciation. I'm surprised I haven't already written a blog entry about the pronunciation of my surname. Oh, wait, I have, but that was not enough to quench the more thirsty minds that read this weblog. 1. I am in nominally the same situation as my more famous colleague, Myra Marx Ferree. People who don't know her typically pronounce her last name like the last two syllables of the word referee. When she introduces herself, however, she pronounces it so it rhymes with berry. She doesn't seem to mind that people say her name various ways, because (at least as she told me) she reasons that both pronunciations are Americanizations of the German pronunciation, so why be fussy about it? 2. The real German pronunciation of Freese sounds something like Fray-suh. I said in my earlier post I have an unrelated college friend with my last name whose family pronounces it so it rhymes with crazy. This seems to combine being non-intuitive and non-authentic. Apparently he had started making an effort to change how he said it to "freeze", but this met with much resistance from his family, including a threat from his grandparents to disown him. So some people do choose to be fussy, regardless of how rational are the grounds for fussiness. 3. My parents do pronounce our last name freeze. However, my parents don't really pronounce my first name correctly, since they both omit the middle schwa, so I don't know why they should get final say over my last name. Besides my mother, whom I love beyond bloggable words, asserts that her middle name is pronounced like it was spelled Joanne even though on her birth certificate it is Joan. For that matter, my parents say worsch where I say wash, and journally where I say generally, so I've already established ample premise for wandering away from family when it comes from pronunciation. 4. I don't really care so much how my last name is pronounced as long as it is pronounced with one syllable. What I do hate is when it gets spelled "freeze." I did not come up with the idea if I was able to get the world to say my name so that it rhymes with niece it would minimize the despised misspelling, I have to give credit to that to an older sister (thanks Shannon, wherever you may be). I do like the idea, however, and so I will continue to introduce myself with the rhymes-with-niece pronunciation and occasionally to correct people when I'm feeling either ornery. Ah, the arrival of a new school year means the arrival of a new cohort of graduate students unsure of what they are should call the professors in their new department, which means a new round of people referring to me as "Dr. Freese" or "Professor Freese". Since people insist on pronouncing my last name like it rhymes with knees instead of niece, Doctor Freese makes me sound like some kind of comic-book villian who slays victims with his icy death ray. For (a) this reason, (b) a general aversion to honorifics of any sort, and (c) an especial aversion to anything that seems to exult the Ph.D. well beyond what it deserves, I prefer to be called "Jeremy" not just by graduate students but by undergraduates as well. I suppose I would even prefer "Hey Teacher" or "Yo, Teach" if it came to that. My dissertation advisor asserted that as I got older I would be less comfortable with undergraduate students calling me by my first name. I'm curious myself as to whether that would happen. I just got the following e-mail. Question: if a company gives one number as being available 24 hours a day and a different number and a different one as available 7 days a week, which are you supposed to call when? more money and the respect of all? There are no required tests, classes, books, or interviews! Get a Bachelors, Masters, MBA, and Doctorate (PhD) diploma! Receive the benefits and admiration that comes with a diploma! I just dialed the 24 hours number: answering message, with the nice intellectual touch of the speaker being a woman with an English (or maybe South Asian-British-English) accent. You are supposed to leave your name and TWO numbers and someone will get back to you. The 7 days number: Same accent, same message. I wonder if there is so much demand for this that its too much for one meager phone line to handle. A regular reader from South Bend, IN correctly thought I would enjoy the following website, which provides all kinds of microscopic pictures of things. Especially if, like me, you are a sucker from brightly colored abstract art, he pictures are pretty visually compelling, although they don't really do much to evoke what it is you are told it is a microscopic photo of. In response to my post about Madison being #1 college sports town in America, a reader from Madison who has lived here since 1994 reports that she has also never been asked "How ya think the Badgers will do this year? ", despite the magazine author's suggestion that this question is ubiquitous around town. by a strange coincidence, i can sort-of confidently answer 'no' to this. yesterday while coming back from the grocery store a senior-looking man rode by me on the sidewalk on a bike and when he got next to me, said (seemingly to himself) "badgers win?" so i yelled out, "i dunno..." as he rode away. 5 blocks later, he rode past me the other way and said, angrily (to himself again) "they won." apparently he had to double back to let me know the news. some may chalk that up to the "midwesterners are nice" adage, but if you ask me, the old man's tetched [that is, crazy], and his demeanor creeped me out. The episode is made even more intriguing by the fact that the Badgers lost yesterday (to UNLV by the resounding and peculiar score of 23-5), meaning that the man was either lying or mistaken with his news update. Incidentally: I had the chance to dramatically increase my net worth today, and blew it. When I woke up and realized that it was pouring rain, my first coherent thought was how I should log onto TradeSports and bet against the Badgers at the prevailing price, since they were dramatically overvalued given that their offense is precisely the kind that underperforms on a wet day. But I did not actually follow through with this, and so remain destitute, living out of my RV with only a box of Triscuits to my name. I just watched the movie Identity, with John Cusack. I wish I could remember who had recommended it to me as a good film, so I would never listen to any form of art-consumption that they ever had to offer again. I was talking to my friend Corrie afterward, and she stuck up for the film afterwards on the grounds that at least the movie did not follow down the road of its suggestion that maybe it was the angry Indian spirits from the surrounding burial mounds doing the killing (in other words, this possibility turned out to be a red herring). Not to diss Corrie's cinematic criticism, but this seemed to open an entirely new technique of making films satisfying to the liberal moviegoer: offer the possibility that maybe the plot will be resolved in the politically-offensive and aesthetically-stupid way, and then instead just resolve it in a politically-innocuous but arguably even more aesthetically-stupid way. The liberal viewer, being relieved that the film decided not to drive down an ideologically-icky road, then assesses the film as actually being good, or at least passable. Note: Read only if you have not already seen Identity! This may piss you off, but I'm doing it for your own good: In Identity, it turns out that all of the different characters are actually different personalities inside this one serial killer with multiple-personality-disorder's head, where one of them is the bad, killing personality that needs to be rooted out before he kills the rest (all the action is actually going on inside the killers mind). You find this out about 2/3 through. You are led to believe the bad personality is the Ray Liotta character, and that good has prevailed when the prostitute looking for a second chance is the one personality to survive, but actually it turns out in the end that the little kid did not die in the car explosion after all and instead he is the real killer, including a flashback seen where you get to see him actually kill the previous victims and get to see just how implausible it all actually is, even by the standards of a fantasy made up inside a serial killer's head. There, I think that was just my first mercy spoiler. 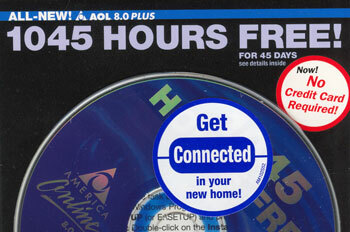 I thought perhaps living in an RV would keep AOL away from me. However, AOL has apparently hooked up with the US Postal Service so that everyone who moves now gets an AOL CD as part of their change of address package. One would think that USPS might have learned from Time Warner about the bad things that happen to organizations that enter into unholy alliances with AOL. Anyway, as you can see above, they are currently offering 1045 hours free over 45 days. Multiplication suggests that there are 1080 hours total in 45 days. So you can be on line for 23 hours and 13 minutes a day during that time and not be billed, but presumably any more than that any you get some unspeakably massive surcharge. Does anyone know more about how this works? if it's true that when the tigers get good hitting, they don't get good pitching, and vice-versa (such that they are truly the victims of bad luck), then it stands to reason that the team's winning percentage should be fairly constant across the runs scored continuum. in other words, as the theory goes, when they score a lot of runs, they allow even more runs, and when they allow few runs, they score even fewer runs, such that they tend to lose regardless of however many runs they may score. thus, the theory suggests that the team should be winning at a fairly constant rate independent of variation in offensive production. they would win about 2/3 of all their games and have about 97 wins right now; good enough to put them in first place in their division and have the best record in the american league (about 8 games ahead of the yankees, in fact). however, the tigers don't score 7-10 runs/game every game they play. instead, they only do this 14.5% of the time. more commonly, they score 0-3 runs/game (59.3% of the time), or 4-6 runs/game (26.2% of the time). in conclusion, it appears that the tigers are not the victims of circumstance, but instead, are a bad team that doesn't hit very well. future research should replicate this approach focusing on the pitching/defense of the tigers. i will speculate right now that when the tigers allow fewer runs, their winning percentage increases. 1. "Let the whole family sniff it" is now a serious contender for being the Official Weblog Slogan. 2. I was amazed that the scratch'n'sniff technology actually does work over the Internet. I have no idea how, but, if you don't believe me, try it right now on your monitor. I don't know if it works with Macs--although they were supposed to be developing a special iSmell interface--but I can tell you that a couple of swipes across my flat-screen PC monitor and now my whole office smells like some kind of sinister substance. "Is there a natural gas leak in there?" one of my colleagues just shouted as they walked by. A Sports Illustrated online story ranks Madison, Wisconsin sa the #1 college sports town in the United States. Really? I lived across the street from the football stadium for 2 1/2 years and I wouldn't have thought this. Fabulous, fabulous college town, yes, but great college sports town? The article concludes its section on Madison by saying "Madison is a town where everyone you meet is your friend as long as you know those nine magic words: How ya think the Badgers will do this year?" First of all, I wouldn't even be sure if someone who asked me this question was asking about football, basketball, or (maybe) hockey. Second, no one has ever asked me this question, or any variant thereof, the whole time that I have lived here. Promise. And, if someone did ask me, I would probably try to stammer out an answer, but I wouldn't automatically consider them my friend. Maybe tomorrow I'll try an experiment where I will go up to strangers and ask "How ya think the Badgers will do this year?" and then follow it up with "Are you my friend?" If I do, I'll report back with the results. anyway i hope you understand and i will see you on tuesday morning. Okay, this weekend I may be scheduled to meet a friend-of-a-friend who has expressed interest in meeting me "to confirm that jeremy is not some elaborate hoax", or something to that effect. Which now puts me in the market for someone who would be willing to impersonate me, most likely on Saturday night. I wish to do this to make the point that if I'm going to go to all the trouble of being an elaborate hoax, I wouldn't allow that hoax to be so fragile that it would hang in the balance of being ruined merely by the prospect of having to have a face-to-face interaction with a skeptic. No half-assed hoaxes here! If any Madison-area readers can or know someone who can help me out with this, let me know immediately! I'm giving a talk in Washington DC next week about survey attrition next Thursday (9/18). I am thanking my lucky buccaneer stars that it didn't turn out to be on 9/19, not because of my general leeriness about giving presentations on dates that are palindromes, but because it's International Talk Like A Pirate day, whose esprit-de-bloodthirsty-raider Rob Clark has honor-bound me to obey. I will have plenty of chance to show off my high seas fluency (and my cutlass!) on the 19th, as it does turn out that the Social Psychology and Microsociology seminar is meeting that day, and I will be driving down to Iowa City to meet friends for the Hawkeye football game the next day. 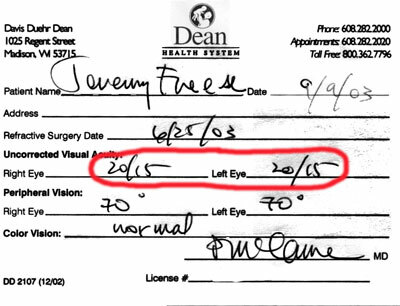 Now that I have had the LASIK surgery, I won't have to sport an eye patch and glasses. good read if you're bored." I'm thinking of adopting this as the weblog slogan. Either that or "As a matter of fact, I don't have better things to do with my time." Any other ideas? A few days ago, as I had backed my car out of its parking place at Noodles, I saw in my mirror that a soccer-momish woman was backing her car toward me. I turned and shouted "No! ", but not surprisingly, given that all relevant car windows were closed, this did nothing to prevent her from backing into me. I put down the book I was reading (thinking that this could possibly obscure the fact that I was completely blameless for the accident) and we both got out of our cars and surveyed the damage. For hers, a Saturn wagon, nothing. For mine, a Saturn coupe, a little puncture in the plastic bumper of about 3/4 inch or so. A small wound, to be sure, but not one that could be fixed without replacing the whole bumper. Which means this woman's insurance company basically owed me a bumper. "So, I should give you my name and insurance company." "No, don't worry about it." [eyebrows furrow] "Are you sure?" "Don't worry about it." I repeated with a wave in my hand, like I was telling a friend not to worry about paying me back for lunch, not telling a complete stranger not to worry about putting a hole in my car. What was I thinking? Why don't I just put on the big shoes and red nose and show myself to the world as the cognitive clown that I am? Which just reminded me of how I have been a sucker as far as this car has gone from the beginning. I bought it in my last year of graduate school, from a first-year student whose parents were bumping her up to a BMW. She wanted $5000, but I decided I was going to be a tough negotiator and try to get the price down to $4800. I began the negotiation by noting that I had done some checking and thought a couple of things with the car might cost more than what we had originally estimated. "I'd be willing to sell it for $4500," she said immediately. Rather than say "Sold!" or "What about $4000," instead I was overcome by guilt. Why should someone not possibly get to extract the highest price from me? "Um, I'd feel better giving you $4800," I replied. Update: A reader from Kent, OH asks: "jeremy, are you serious about the car stories?!!!!!!! oh my. you are a suckeraroosker. or am i being the sucker for believing them?! " Scout's honor, both are true. What happened to this team, which hasn't had a winning season in a decade? Some blame the owner, Mike Ilitch, for not spending money on players. Some blame bad trades by general managers. But the fact is, as outfielder Dmitri Young, their lone All-Star Game representative, said: "When we're hitting, we're not getting pitching. And when we're pitching, we ain't getting hitting." In other words, while some might look at a team that is challenging for being one of the historically worst in its sport and think about blaming those responsible for assembling the team (or even the economic situation in baseball that makes it difficult for Detroit to field a higher-payroll team), the blame instead is placed on bad luck--the failure for good hitting and good pitching to come together in the same game. By my reading of the stats, the Tigers have scored 20% fewer runs than any other team in the American League, and they have allowed more runs than all but one other team in the AL. Meaning that it's really not that often that Detroit has either good hitting or good pitching. So, is it really bad luck that on those occasions that Detroit does get good hitting or pitching, the other side of the baseball equation is not there, or would it be a bigger fluke if they did get both in the same game? Actually, let's be more precise about this: Say the Tigers get "good hitting" once every three games and "good pitching" once every three games. If a team's pitching and hitting were independent, that would mean that, for over half their games (5/9), they would have either good hitting or good pitching, but only for 1/5 of those games (or 1/9 of all games) would they happen to get good pitching and good hitting in the same game. In other words, the players should have an experience where 80% of the time that one side of the game is working, the other side isn't. When a team can't seem to put pitching and hitting together in the same game, the first conclusion should not be that they are the victims of bad luck, but that their pitching and hitting is usually not very good. days is that i have less of an idea of what's happening in your world. Busy! Even despite my reduced formal obligations this semester, the start of the semester has led to much going on. Especially getting settled into the RV, which I managed to get running long enough to now have parked outside a Shopko in Fitchburg (as an aside, I never realized Shopkos were so large, more like K-Marts than like Walgreens). And I've succumbed to this ridiculous addiction to trashy mystery novels, although I have resolved not to begin any more until I have some of the massively overdue things in my life under control. The good news: My Hawkeyes crushed the hapless University of Buffalo Bulls last Saturday, 56-7, putting them at 2-0 for their intrastate clash with Iowa State this weekend. The middling news: Dahlia is smack at the median in the first week of Rob Clark's NFL pool, which I've opted out of since I've agreed to write a haiku for the winner. In Rob's pool, you pick every game and the winner is the one who makes the most correct picks for the 256 games over the course of the season. The bad news: Sunday's dolphin-squishing by the Houston Texans put me--along with 14 of the 18 other participants--on the edge of the waterfall in Rita Noonan's SURVIVOR NFL pool. In that pool, you pick one team to win each week, you can't pick the same team twice, and the second time your selected team losing your over the waterfall and out of the pool. I can't believe I might be out of that pool by the end of Week 2. I should be having Dahlia make my picks for me, she's much more into the NFL than I am. The rest, I knew about. But I thought Ashley Amberson was different! A Washington Post poll finds nearly seven in 10 people believe it's likely Saddam was personally involved in the attacks carried out by al-Qaida... Veteran pollsters say the persistent belief of a link could help explain why public support for the decision to go to war in Iraq has been so resilient despite problems establishing a peaceful country. Okay, so polls like this have been coming out for a long time, despite the abundance of reasons to think that the minority of people who do not believe in any link between Saddam Hussein (I refuse to refer to him simply by his first name) and 9/11 are right. To really get a sense of the extent to which Americans have a distorted view of the last two years of history, however, the poll I would like would ask Americans who they believe was more responsible for the 9/11 attacks: Saddam Hussein or Osama bin Laden? Am I being overly cynical to speculate that at least 20% of Americans would say Saddam Hussein? Maybe my friends who work for a market research company can slip this in as a non sequitur question on one of their large-scale customer satisfaction surveys. ...but this is really not the most welcome e-mail to be receiving from one's employer if one is an untenured professor at a university facing steep budget cuts. self-assessment tools to networking tips to recovering from a job loss. Breakout sessions allow you to customize the program to meet your needs. one day to think about the rest of your life! Shelly B convinced me that my reluctance to wager substantial sums of money on political outcomes was foolish, and so yesterday I signed up for a TradeSports account. I saw immediately that Bustamante was overpriced in the California election, and that the recall failing was underpriced, so I bet about $100 or so between these two outcomes. Today, the prices were more in line with rationality, and so I was able to sell and make, subtracting fees, about a $6 profit, or twice as much in a day as what I would make in a year if I put the same money in a passbook savings account. Or, alternatively, given the time involved, I made about as much as I could make working a minimum wage job, only this way I had to risk money. I did make some other bets, including one speculating that there was more than a 40% chance that Saddam Hussein would be captured by the end of the year. My feeling is that people have given Hussein a mystique that underestimates his true probability of being captured, given that his sons and top aides have been successfully captured, but we will see how that turns out. So far, I am not worried about this turning into some kind of self-destructive hobby. Certainly, not as destructive as my recent addictive turn toward trashy mystery novels. Or, some would say, the weblog. don't take offense, this is really just curiosity: would you say that your enjoyment of blogging has increased, decreased, or stayed about the same since you started? what makes it fun? do you think you'll get tired of it soon, or will it just continually bloat your sense of self-importance so that it becomes harder and harder for you to stop? Hmm, let's take these one at a time. would you say that your enjoyment of blogging has increased, decreased, or stayed about the same since you started? I would say that I'm in a period of diminished enthusiasm for the weblog right now, as evidenced by the low volume of recent posts. I don't know if this means that I'm losing interest in the sense that I will it up. It was always an experiment, after all, and a way to feel part of the zeitgeist. I have vowed to myself that I would not do this if it ever felt like it was a chore to maintain. So as long as I'm continuing to write posts, it can be taken to mean that I must be enjoying myself. I think the fun part of it for me is that it's a way of doing something (very) modestly creative during the day. I know, I know, my job should be affording all kinds of creative adventures in social research, but let's not talk about that right now. I also the weblog appeals to the archival impulse that has always run strong within me. I don't think I have either the pontificative urges of the people who run political weblogs or the emotional-exhibitionist-urges of people who write weblogs that are deeply personal, introspective diaries. do you think you'll get tired of it soon, or it will just continually bloat your sense of self-importance so that it becomes harder and harder for you to stop? As I said, I could grow tired of this any day. In my case, I don't really think it has resulted in any bloating of a sense of self-importance in the first place, much less some kind of addictive bloating. Maybe even the opposite, actually, as it's led me to reflect more on our society's widescale search for self-expansion that I think it part of the Rise of the Blog. People find so many ways to delude themselves into believing they are of far greater consequence than they are, and weblogging is yet another technology by which the self-deceptive trick is accomplished. Speaking more generally about weblogging, I do think that sense-of-self-importance does have something to do with many people's putting themselves out there; as with many causal relationships, however, it's hard for me to see how much of it is people with inflated senses of themselves selecting into blogging vs. blogging itself contributing to further one's sense of self-importance. McGraw-Hill is proud to introduce SOCIOLOGY MATTERS, with POWERWEB, by Richard T. Schaefer. Available now, this new paperback text is a low-cost, highly focused version of SOCIOLOGY: A BRIEF INTRODUCTION, Fifth Edition. Its design and pedagogy are both straightforward and streamlined, and its newly written chapter introductions highlight a unifying theme--answering the question "How does sociology matter?" I was reminded of the experience of a friend from the West Coast who interviewed for a job in a small Midwestern city. Everyone she talked to during the course of the interview kept saying about the city as a place to live, "It's a great place to raise kids" (even though she didn't have any kids). She said that "if all anybody can say about a place is that it's a great place to raise kids, you begin to think that it probably isn't even that great of a place to raise kids." You have to wonder if introductory sociology content has to be presented in a way that explicitly and repeatedly asserts that what it is saying matters, maybe it (gasp) really doesn't matter that much after all. Or, maybe, the rascally students today are just too apathetic to understand what really matters, although I'm always suspicious of that kind of codgerly perspective. Argh! The busier things are, the more things come up that would be fun to add to the weblog, but the less time one has to actually indulge in writing to the weblog. Especially when today, after rushing so much to get out of the RV and up to campus that I left half my face unshaven, I then spend something like 30 minutes driving around trying to find the parking lot I've been assigned to this year. Part of my driving around lost, incidentally, included a particularly confused stretch where I was accidentally veered onto one of the bicycle/pedestrian paths and had to follow it for what seemed like half a mile before there was a street-intended-for-cars I could turn off on. undefeated season, and a bountiful harvest are never out of the question. be the year that YOU shine! Yes, that's right, YOU!